What can the assembly line teach us about innovation? Henry Ford, pioneer of the automobile, once said that "history is more or less bunk". Ignoring Ford’s assertion, I believe we can learn much from the history of the assembly line, which was invented at the Ford factory in Detroit 100 years ago. Though it might sound like a boring topic, the history of the assembly line can teach us much about innovation, an in-vogue and sometimes overhyped topic. Indeed, the breakthroughs that led to the assembly line, an invention that improved standards of living worldwide, can teach us important lessons about innovation that are relevant today. Between 1910 and 1920, when the Ford assembly line was first deployed, the price of Ford cars plummeted (75 percent), the number of cars produced rocketed (5,000 percent), Ford employees got a pay rise (100 percent), and company profits accumulated. Breaking all previous rules of economics, and disregarding the advice of his executives and stockholders, Henry Ford was "doing more with less" on an unprecedented scale. Ford undercut the competition so much that by 1921 he had 61 percent of the car market. In response, his competitors simply had to adopt the assembly line to stay in business. But what exactly was the Ford assembly line? Five elements define it: subdivision of labour, interchangeable parts, single function machines, sequential ordering of machines, and automatic movement of the produced good (the most famous attribute of the assembly line). 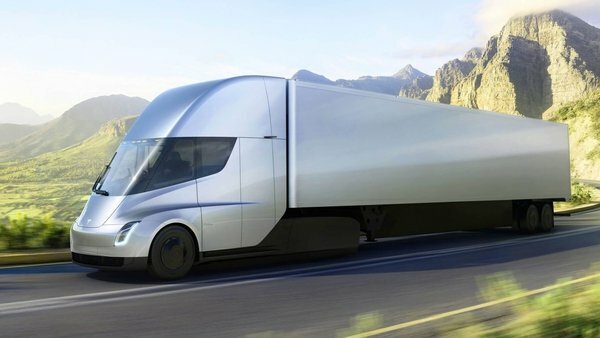 Brought together, these elements resulted in a new production system that transformed mobility, manufacturing, and modern life all over the world. However, the managers and engineers responsible were not consciously trying to develop a new production system. They were simply looking for ways to keep up with the insatiable demand for automobiles, were animated by a vision of efficiency and improvement, and were given the space and encouragement to experiment. So what are some of the lessons about innovation we can learn from the history of the assembly line? Forerunners of the assembly line were numerous, so existing practices were borrowed, reversed and integrated in a new way at the Ford factory. For example, subdivision of labour was described in Adam Smith’s description of a pin factory in his 1776 book "The Wealth of Nations". Interchangeable parts were first used for gun manufacturing during the American Civil War and the idea of sequential assembly was a reversal of the existing practice of sequential "disassembly" that happened at slaughterhouses. The Ford assembly line integrated these ideas in a unique way. It would be inaccurate to say Henry Ford invented the assembly line, but he hired a diverse team of smart people that did. A diverse team meant availability of a broad pool of knowledge of what other car manufacturers and other industries were doing. This was crowd-sourcing of ideas in an old-fashioned way. Thanks to factory electrification, the Ford factory could be designed in an open way that deliberately encouraged circulation of people, ideas, and eventually cars. 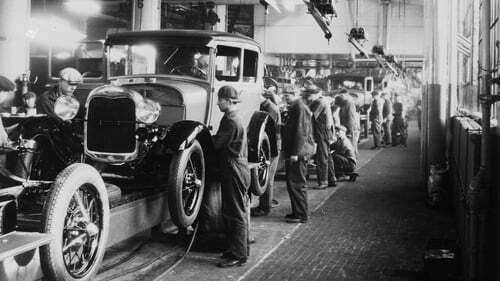 Prior to the invention of the assembly line, individual cars were assembled without being moved along. The first version of the assembly line simply involved pulling a partially assembled car by rope from one workstation to another. When the line was first introduced, Ford himself didn’t like it. But when he left on a trip shortly after, his team put the line back in and it stayed. Such happy accidents are a feature of experiment-friendly environments. There was no eureka moment with the invention of the assembly line. The team involved were not aware they were inventing a new system, which emerged even before the phrase "assembly line" was used to describe it. The managers and engineers were animated by a vision of accelerated production and efficiency that created a dynamic of feedback, discussion and improvement that proved crucial. Initially, the assembly line was celebrated for raising living standards with a subsequent enthusiasm for mass production even carrying into the arts with the popularisation of the chorus line by groups such as The Rockettes. The assembly line inspired the design of new cafeterias, supermarkets and the newly emerging highway system. Ford opened many factories in Europe (including in Cork in 1917), but the productivity of these factories never matched the US, though it was hard for the managers at the time to discern the underlying cultural reasons for this. During the 1930s, the assembly line was blamed for contributing to the depression. In the 1950s, worker unions in the US had finally won recognition and could negotiate improved wages. The ensuing bureaucracy proved so resistant to change that when the Japanese re-invented the assembly line in the 1950s and 1960s, they rapidly took market share from the US car manufacturers who struggled to respond. The last lesson is the importance of history, the study of which can "defatalize the past". The invention of the assembly line wasn’t inevitable and neither was its eventual form. For example, had the assembly line been developed for the electric car, which in the early 1900s was seen as superior, the world’s transport system could be very different today. When something becomes a success, its story often changes; Henry Ford disregarded many of traditions, but he inherited lots of ideas too. Lastly, many of today’s debates about automation and fear of worker unemployment have echoes of the debates in the 1950s, with many lessons from that era pertinent to today. Whatever happened to the street lighting man?